Entrati in flotta tutti gli aerei previsti. Ritirate invece 29 macchine, 3 in più di quanto scritto nel piano flotta ad inizio 3d. Impressionante la consegna di 6 A380 negli ultimi 30 giorni, gli ultimi 3 dei quali sono arrivati il 28 e 29 Dicembre. Dal manifesto sottostante, si ricava inoltre che nel 2016 il riempimento medio di ogni volo è stato pari a 283.5 pax, in moderata crescita rispetto ai 275.8 pax del 2015. Vista la "leggera" differenza di taglia tra gli aerei entrati in flotta e quelli dismessi, mi sembra un risultato molto preoccupante. Nel 2016 i pax sono arrivati a 55M (51.3M l'anno scorso) i voli pax sono stati circa 194.000 (contro i 186.000 del 2015). E alla fine anche Tim scese sul pianeta Terra aprendo ai NB. 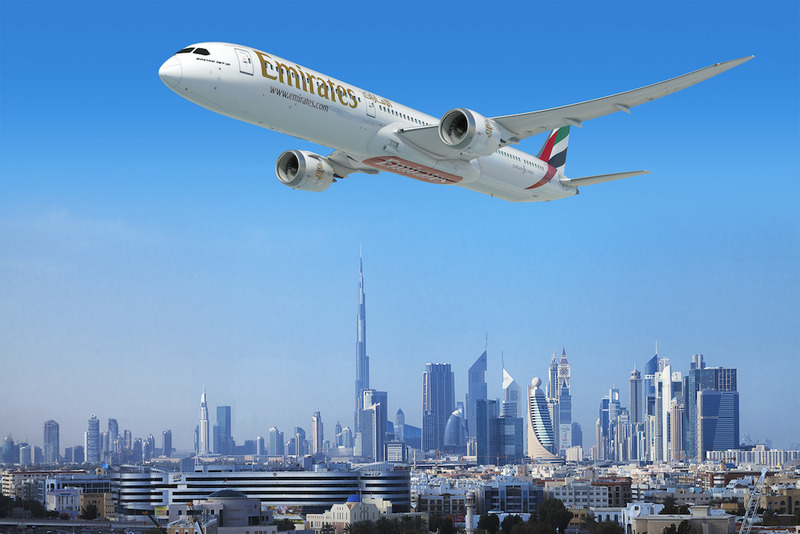 Emirates (EK, Dubai Int'l) is considering narrowbody aircraft given their 'tighter cabins and fewer amenities' airline President Tim Clark has told CNN. In an interview with Richard Quest, Clark said three studies had been submitted to the carrier for consideration. As such, over the next eighteen months, a decision will be made on whether to add aircraft such as the A320 from Airbus Industrie or the B737 from Boeing, combining that with an order for smaller widebody jets, or continuing to buy widebody aircraft exclusively, he said. Coupled with Dubai World Central's greater terminal and gate capacity, the narrowbody jets could allow the carrier to develop thinner routes currently unsuited to its existing fleet of ninety-two A380-800s, ten B777-200(LR)s, ten B777-300s, and 128 B777-300(ER)s.
The Dubai-based carrier has yet to make a decision on whether to order the A350 or B787 given it axed an order for seventy A350s back in June 2014. Among the types under consideration are the A350-900/-1000 and the B787-9/-10. "When the time is right we will decide," he said. "But so far, we are just biding our time to see which way it all pans out." Una Emirates con NB andrebbe a sovrapporsi totalmente a quanto già offre Flydubai, a questo punto potrebbero sfruttare maggiormente questa compagnia per servire le destinazioni piu' sottili o in alternativa assorbire direttamente Flydubai mettendole marchio Emitates. Però le "fewer amenities" di cui parla Tim, abbinate ad un hardware che non è certo quello di FR, sembrano descrivere FlyDubai o comunque qualcosa di molto vicino. Qui ci sono alcune foto degli interni: non mi sembrano poi molto diversi da quelli dei NB usati dagli altri vettori premium del Golfo. Ho volato con FlyDubai, 738 configurato con pitch ridotto (ok, venivo dalla Y di EK sul 380 che ha spazio da vendere, ma era veramente strettino) servizio a bordo totalmente a pagamento, IFE compreso - salvo la mappa del volo, non ricordo se i sedili avessero la possibilità di reclinare (volo diurno in entrambi i casi). Diciamo che come esperienza di viaggio si colloca vicino - ma forse un filo più in basso a causa dell'a/m utilizzato) a quella di U2. Una o due file di poltrone di Y in meno risolverebbero il problema del pitch, mentre una tariffa all inclusive potrebbe essere creata proprio per dare una certa continuità con gli standard attuali di EK. Mi sembrano soluzioni che con un costo (e rischio) moderato, potrebbero andare nella direzione auspicata da TC. Peraltro prima dei NB, direi che sarebbe ora che ordinassero qualche decina di piccoli WB. Mentre nel resto del mondo si fa la corsa agli armamenti con FSC che aprono o assorbono LCC e LCC che aprono rotte sempre piu' lunghe... a Dubai FZ ed EK sono praticamente concorrenti. Da notare come EK abbia gia' accordi di interline (e codeshare) con LCC, anche spinte. Onestamente non capisco come non ci siano piu' sinergie. Con i riempimenti medi che hanno è assurdo continuare con una flotta di soli 77W e 388. Vedrei benissimo un bel po' di A321Neo magari anche in versione LR, darebbero il giusto mix di flessibilità alla flotta. Ma ordinando oggi fra quanti anni verrebbero consegnati ? Il backlog mi sembra imponente. Dubai: Emirates is set to unveil the enhancements to its First Class cabins and new features in the Business and Economy Class accommodations. The entirely redesigned First Class, which will make its debut on board a Boeing 777-300ER, will showcase six private suites in a new layout. The new aircraft will also boast a range of other new features in the Business and Economy class cabins. “All cabins will sport a totally fresh new look,” said Tim Clark, president Emirates Airline. The airline will announce the destinations where the new Boeing 777-300ER is to be deployed in due course. Emirates has the largest fleet of Boeing 777 planes that fly to six continents. It claims to have pioneered the private suite concept on commercial flights in 2003, establishing a new standard for First Class travel. “Our products and services across cabin classes are continually improved and enhanced. But what our customers will see on Emirates’ new 777s starting from November will be a much bigger revamp that takes our onboard experience to the next level,” said Clark. La decisione sull'ordine 787 vs 350 avverra' probabilmente al Dubai Air Show in novembre. Emirates, the largest operator of wide-body aircraft globally, will decide by year end on a multibillion dollar order in which the airline will pick between Boeing’s Dreamliner 787 model or Airbus’ competing A350, the carrier’s chairman said. The decision between the two aircraft models reignites a fierce battle that played out in the run-up to the Dubai Air Show in 2007 when Emirates placed a US$31 billion order that included 70 A350s rather than the 787. Since then it has rolled back on its commitment to the A350 following a review of its fleet requirements. Emirates, like most airlines, conducts a review of its fleet as it looks to retire planes and introduce new models in line with its business objectives. Those decisions are influenced by yields and margins, which have come under pressure as a result of a downturn in the travel industry amid terrorist attacks in Europe and a more competitive operating environment where low-cost carriers are deploying narrow-body planes on long-haul routes. In June, Bloomberg reported that Emirates was in talks to buy 20 A380s in a deal worth about $8.7bn, according to list prices before discount. An order of 20 Boeing 787 Dreamliner planes is valued at about $5.4bn according to list prices, while an order for 20 Airbus A350s is worth about $6.3bn. Both Sheikh Ahmed and the Emirates president Tim Clark have declined to provide further details about the size of any future aircraft order. However, Boeing’s order book, as of July 4, lists an order for 30 787 planes from unidentified customer(s), at a value of $8.1bn. In 2014, Emirates cancelled its order for the 70 A350 – valued at $16bn – which makes the chances of a repeat order potentially unlikely. Moreover, the expanded partnership agreement Emirates announced with the low-cost carrier flydubai last month will pave the way for greater network integration and crossover of passengers out of their joint hub at Dubai International Airport. The flydubai low-cost model, which relies on single-aisle planes, allows penetration and connectivity of markets that complement the wide grid of Emirates. The closer integration means promoting a seamless form of co-operation between the two companies that either does not currently exist or is fragmented. In an interview with The National last month Mr Clark said the carrier was also eyeing Boeing’s 777X, which comes into operation in 2020 and complements Emirates’ fleet of 777-200 and 777-300 aircraft. Choosing the 787 would also match the carrier’s firm order for 150 777XS and the additional 50 options for the plane that will replace the fleet of 777-300ERs and 777-200LRs. Changing market dynamics and uncertainty in the global economy, make it likely Emirates may well lean towards the 787 because of its fuel efficiency advantages, which is an issue of contention between the carrier and the Toulouse-based Airbus when it comes to the A380. Saj Ahmad, chief analyst for London-based Strategic Aero Research believes the 787 is “right sized” for Emirates. The Dubai Airshow takes place from November 12-16 this year. Plane manufacturers compete to secure aircraft orders around the event. Da airfleets.net risultano consegnati nel 2017 6 773 e 4 A380. In totale,quanti aerei nuovi dovrebbero ricevere entro la fine di quest'anno? Annunciate le prime rotte col nuovo prodotto di First sui 77W, saranno BRU e GVA dal 1 dicembre. Emirates is reportedly close to signing a deal with European plane maker Airbus for more A380 superjumbos worth at least $14 billion. Sources familiar with the matter told Reuters that Airbus could sell more than 30 A380 to the Dubai-based airline. The deal is expected to be announced at the opening of the Dubai Airshow on Sunday, Reuters reported. It quoted a spokeswoman for Emirates, which is the largest A380 buyer with 142 on order and 100 already delivered, as saying: "We do not comment on rumours or speculation." Emirates chairman and CEO Sheikh Ahmed bin Saeed Al Maktoum said last week that it was working with Airbus on a follow-up deal, which would bring much-needed relief to the A380 programme that’s running out of orders as carriers pick smaller more fuel-efficient aircraft. The Airbus A380, which is the European manufacturer’s largest and most expensive plane at a list price of $436.9 million, has become a tough sell for the company. Emirates represents the only major customer for the double-decker, with 142 of the jet’s 317 net orders as the airline uses the model as its flagship. Airbus has cut back production of the superjumbo over the past few years to adapt to the slowing order flow, moving from 28 deliveries in 2016 to just eight a year from 2019. Una domanda: quando entreranno in servizio i 77W con la nuova J? Grazie. Se sono gli stessi con la nuova F, l'1-12 sui voli per GVA e BRU. Appena arrivato un ordine per 40 787-10. E' il layout che sfrutta al meglio lo spazio, ma non permette l'accesso al corridoio a tutti i pax. EK ha da sempre una configurazione simile a questa nei 777, ed una a posti alternati nel 380. Per cui dovrebbe avere avuto tutti i dati per prendere la decisione più redditizia. Mi sembra un ordine assolutamente centrato. Nella quantità, nel modello, nella versione e nella flessibilità. Complimenti a EK. Dubai, UAE, 12 November 2017 – Emirates, the world’s largest international airline, today announced a US$ 15.1 billion (AED 55.4 billion) commitment for 40 Boeing 787-10 Dreamliners.In the presence of HH Sheikh Mohammed bin Rashid Al Maktoum, Vice President and Prime Minister of the United Arab Emirates, and Ruler of Dubai, HH Sheikh Ahmed bin Saeed Al Maktoum, Chairman and Chief Executive, Emirates airline and Group signed the agreement with Boeing Commercial Airplanes President and CEO Kevin McAllister on the opening day of the 2017 Dubai Airshow. Emirates’ agreement includes conversion rights to switch the aircraft to 787-9s, offering the airline additional flexibility for its future fleet and global network. Emirates’ Dreamliners will be delivered in a mix of two and three-cabin class configurations, potentially seating between 240 and 330 passengers. These aircraft will be delivered in phases from 2022 onwards. Emirates is a powerful engine for American aerospace manufacturing jobs. Applying the US Department of Commerce jobs multiplier (every $1 billion in US aerospace exports supports 5,200 American jobs), this new order will create and support over 78,000 additional jobs in US aerospace manufacturing – not only with Boeing, but also with the thousands of other suppliers in the value chain across the US, many of which are medium and small-sized businesses. Today’s order comes on top of Emirates’ historic purchase of 150 Boeing 777X aircraft equipped with GE9X engines at the 2013 Dubai Air Show, to be delivered from 2020 onwards. Emirates’ partnership with Boeing spans decades. 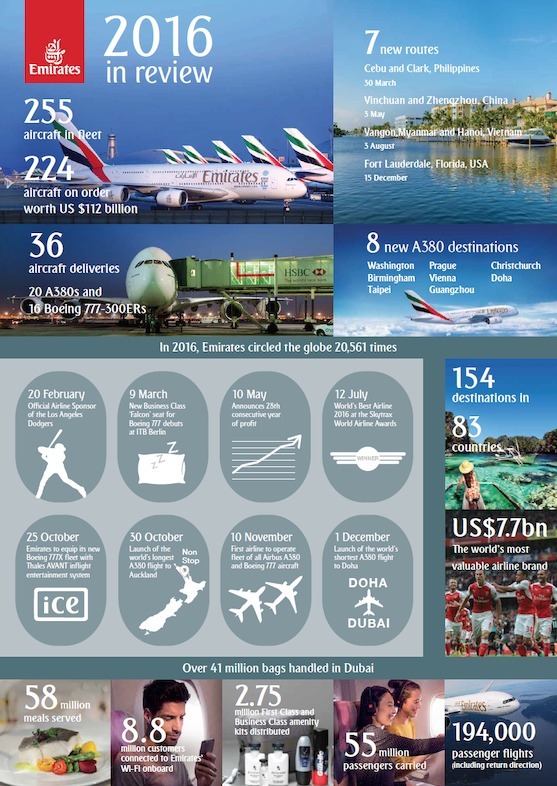 Emirates is by far the largest Boeing 777 operator on the planet with 165 777s in service today. With today’s announcement, Emirates will have committed to future delivery of 204 Boeing wide-body aircraft.